One of the latest works to go on display at the Treasure Hub is a landmark painting by an iconic north-east artist. The work by Alberto Morrocco, which depicts a vase of flowers, was originally gifted to schools in the city which he attended. Morrocco was born in the city in 1917 and also lived in France, Switzerland, and Italy. He is renowned for his paintings of Venice as well as figure paintings and interiors. He also worked as a teacher at the Gray’s School of Art and as head of painting at the Duncan of Jordonstone College of Art. Aberdeen’s Lord Provost Barney Crockett visited the venue yesterday to get a look at the painting. He hopes it will spark fresh interest in the north-east artist. 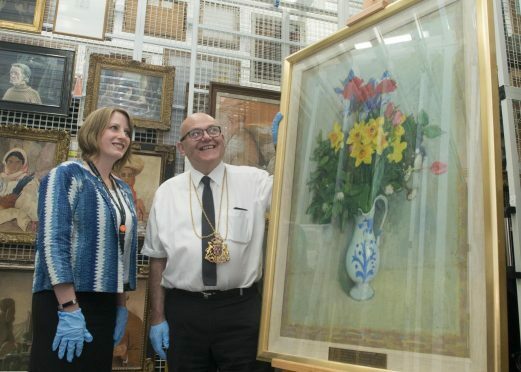 He said: “Aberdeen’s collection of Morrocco’s work really is one of the city’s treasures and it’s great to see this painting in the hands of our expert team of curators. “I’m hopeful more people will now get a chance to see the piece and learn more about the artist. Christine Rew, the art gallery and museums manager at Aberdeen City Council, said he was glad to see it join the collection. He said: “This is a beautiful painting by a much admired Scottish artist. “Aberdeen Treasure Hub houses many works of art by renowned artists and we’re delighted that this work by Morrocco has joined them.